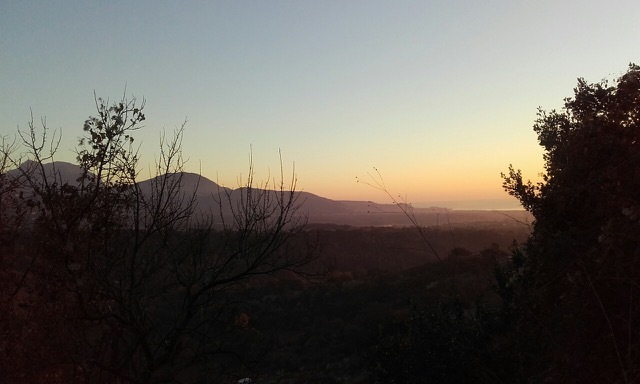 With the New Year here I am pausing to reflect on these first few months in Calabria. My heart is very heavy as I write this, on personal levels. The months here have been busy, I struggle to grasp all that has occurred and is occurring both out of the necessities of life as well as the by choice. 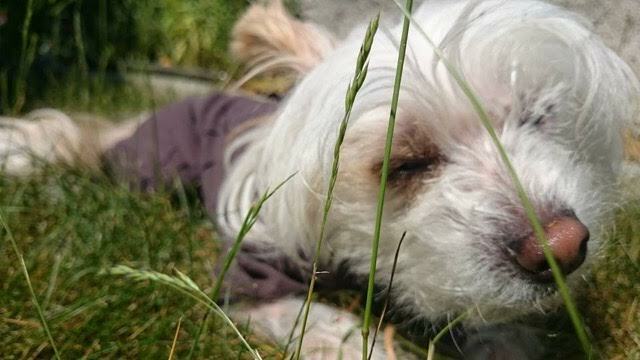 In the last update, I introduced my travel and life companion - my 2 year old Chinese Crested dog Elliot. 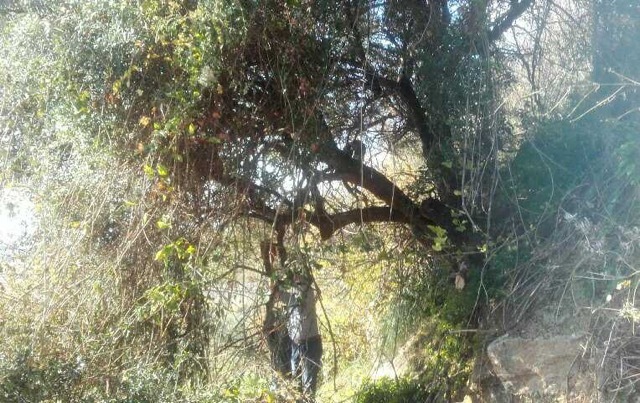 I tearfully must quickly acknowledge that at the beginning of November, whilst on a lovely hike up in the mountains at Pollino National Park with friends who were visiting from Venice, he ran in fear from a hunting dog who wanted to play and chase. He has not been seen since…. This past two months have been very difficult for me. We searched for many days, and utilized all resources to locate him. Sadly, within two days of him running off, the air and ground at the mountain turned frosty and within the week was snow laden. This mountain is purportedly the highest peak in our area of southern Italy - it is beautiful and isolated. During this time.. I found more love and humanity in the men who work the area near the ‘rifugio’ than I ever imagined possible. The day he went missing was a busy Sunday with many vendor stalls of meats and cheeses and tourists and locals alike out for a hike. Everyone helped or listened with intent as we worked tirelessly to find him. From people advising of possible sightings to endless 4x4 jeep rides to areas where he was thought to have been barking. Sadly, no one understood that my sweet pup was not a dog that was known to bark. Each day I returned to search, the men who worked the cattle were kind and sympathetic, offering to help and always checking to see if I was okay. I was not… and am not. I struggle to imagine and accept his fate. In the month of October was the olive harvest. The farm that I have had the pleasure of spending time at has a number of trees that supplies a years worth of oil to the family, as well as to the couple that aid in the harvest. The method of payment for the work done to aid in harvest is that the oils produced are split equally between all the working families. In this case, between two families. This year, the harvest was back up in total litres produced after a few difficult years, however not as high as in the past. It was quite an experience to be able to aid and learn about the cultivation and process of this tradition and way of life. I worked for a few days with a lovely elder woman of 86 years as we laid nets, picked olives from the ground, gathered and cleaned the debris from the nets and bagged the fruit as it fell. She spoke in the local dialect to me, and we made it work as time went on, the one thing I learnt most from her was the phrase “YOU MUST LEARN” as she repeated her instructions on the basics of emptying a net into the bucket throughout the day. Progress on the house has been slow as the work crew was aiding another family with a terrible water problem at their vacation home. The work has begun again at my house and I am told it will continue through now. 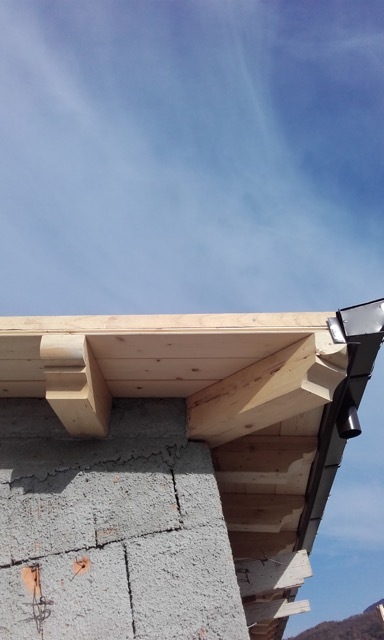 I have been able to make some design and aesthetic choices for the house already and am excited to see it transform into a home full of character and charm, characteristic of years gone by but new in construction. 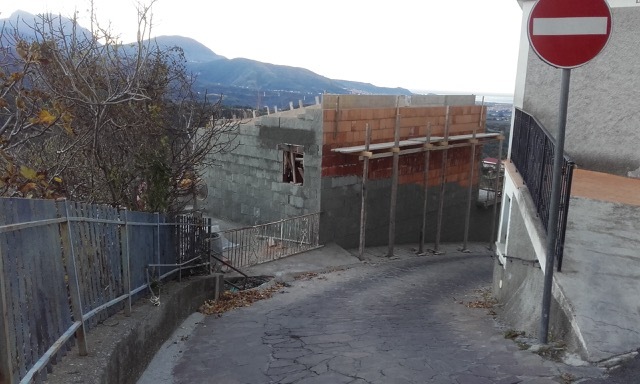 The second level of the house is nearly complete with the walls erected and the roof is currently being completed. 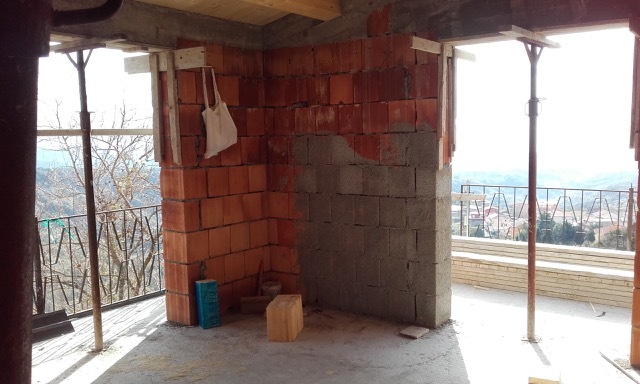 I am hopeful to see some steady change and progress in this becoming my home, however I have been told by the engineer on this project to expect up to a year before it is complete. The views from the living/entry room firmly established with these two sets of double doors.. 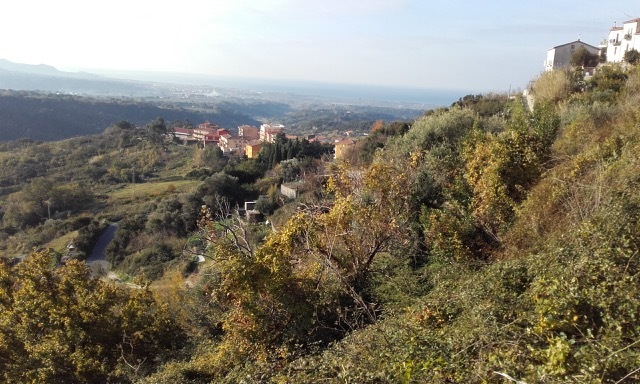 In recent weeks, I have had the opportunity to purchase a plot of land that is directly beneath my initial property and house project on the hillside in Santa Domenica Talao. 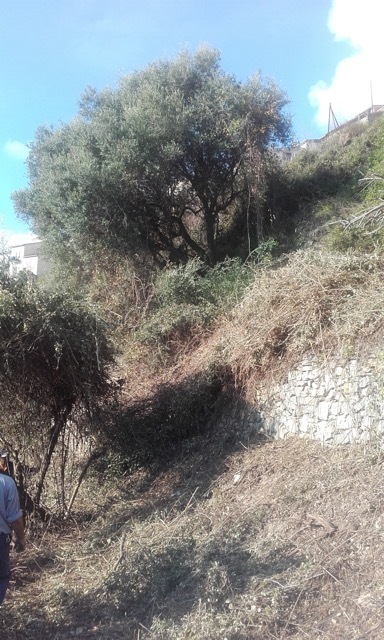 It is seemingly larger because it is a steep slope with lovely terraces that were established many decades ago. There were a number of reasons for this purchase at this time; including the feasibility of the cost to purchase, the timing to clear the land through cutting and burning prior to the house being further constructed as well as planning the two spaces together for a lovely flow overall once it is completed. This past weekend, with the work of one of the local village men, a large portion of the land was cleared and we discovered many treasures. 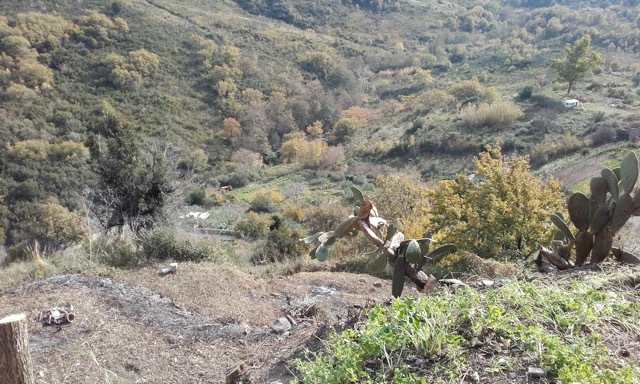 When I purchased this land, I knew it was overgrown like a jungle but underneath there were three terraces of flat useable land cascading down the hillside. In the not so distant past, this property had been a vital vegetable garden for the family. In revealing these terraces and amazing fertile soil, we also discovered old rock walls and staircases, some intact some not. The most beautiful things I have seen are two very old olive trees, encapsulated currently with a lot of overgrowth and vines, and I am told they will be producing wonderfully next year if we free them from this growth and trim them back. I have also been told that these trees would likely be in excess of 100 years old. 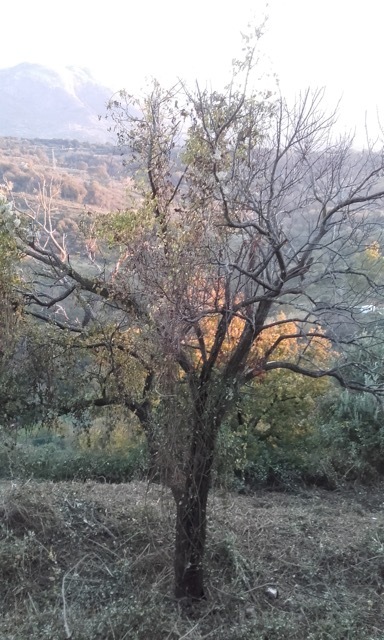 There is also an old apricot tree that stands tall and proud, in the same state. I am hopeful to be able to rejuvenate this special tree. The previous owner, a lovely lady of 92 years, spoke fondly of this tree from her memories. It would be an honour to have it as I move forward in my life on this property. 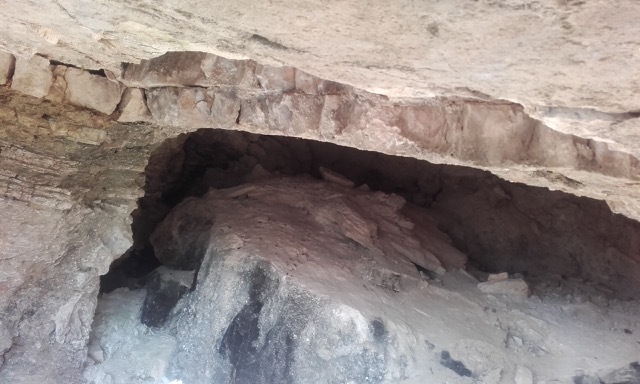 Within this photo are olive trees, the apricot tree and believe it or not - a grotto entrance! 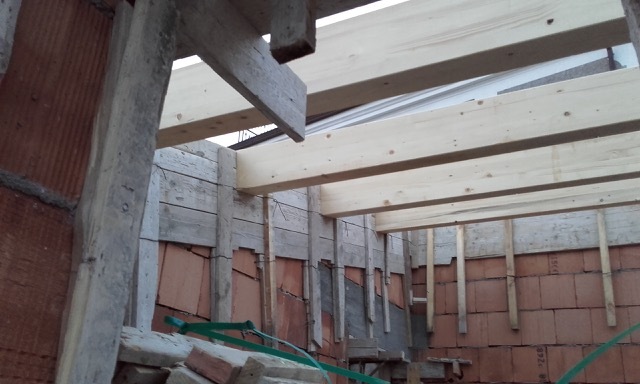 The view from the second lower terraced level looking up towards the house. 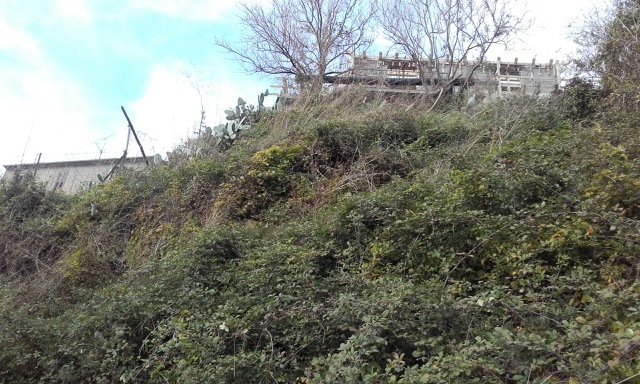 The grotto entrance is buried in this overgrowth and brambles. Sadly the apricot tree got pruned down greatly, and I hope it returns to its splendour. I am told by the men that all trees pruned will be vital and growing by March, when the sun is warm. Being in the south, trees do grow and establish quickly. My fingers are crossed. Trimming back to overgrowth and freeing this beautiful olive tree. 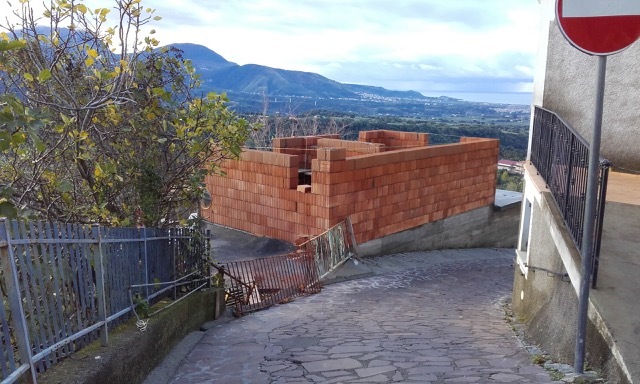 Many old walls were discovered and many new dry rock walls will be built in coming years as I set this hillside garden into use..
Santa Domenica Talao is known for its strong winds, especially along the back of the village where my property is located. I am thrilled to say that the majority of this new garden was free from the strong winds and the sun was hot. In future years, many a lovely dinner and evening will be had under the clear starlit skies. The plans are simple for this space... fruit trees; including olive trees, apricot, pomegranate, orange, mandarin, lemon and fig, a small working vegetable garden for myself and an outdoor space for dinners and guests surrounded by rustic wood rail fencing for safety on the terraces and unobstructed sea and mountain views. 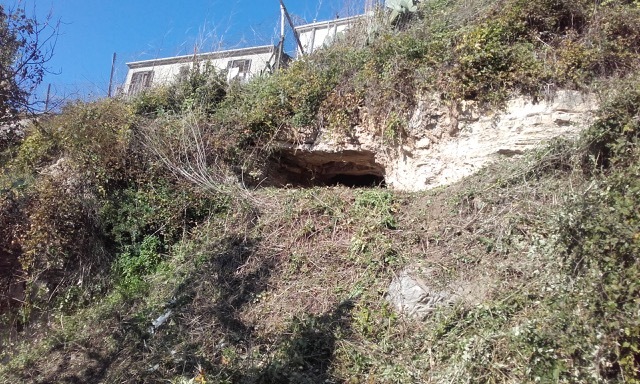 When the initial house purchase was made, the architects office had told me that there was a grotto (rudimentary cave) on the property, just under the house. 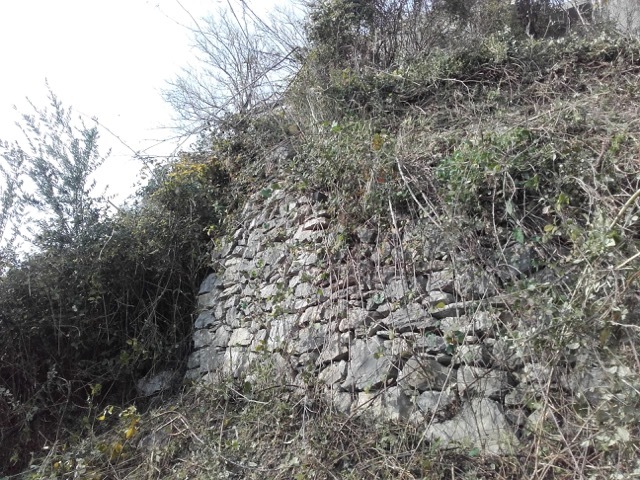 I had made enquiries and also scoured a bit of the upper hillside with one of the local men previously, but no one was able to provide further information. Once the clearing of this land started this weekend I was quick to scamper down and begin searching the upper hillside for the entrance to the grotto. It did not take long before I was looking upwards towards a dark shadow that could only be the entrance, obscured by brambles and years of neglect. Ecstatic is one word to describe my reaction. I was thankful to be alone on the side of the hill at that moment as surely anyone watching would have thought the Canadian woman had truly lost her mind! The following day, it was fully revealed and I sat in the entrance of it with a friend and revelled in the miracle that is unfolding in my life. The last few months have been extremely difficult with some lovely moments also, that is for certain.. but all has a purpose. Sitting in the sun on this evolving hillside is giving me the breathe of fresh air to continue on in the process when at times I have honestly felt like packing up and returning to Canada. May you all have a blessed and wonderful 2016.. as will I. I am thankful for all that this adventure has brought to my life.. new friends and loved ones, a new life with new traditions and cultural attributes to learn. And on a positive Happy New Year note, this week I made the decision to regain a four legged companion… This is Oronzo. 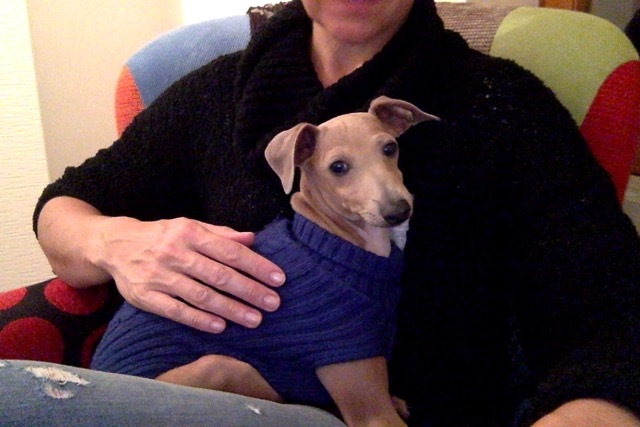 A lovely 5 month old Italian Greyhound, and as I discovered yesterday he loves to run alongside me on a dirt road in the mountains.. it looks like I have a suitable running partner and life companion again as I continue this journey. Find out how Tammy is now getting along in her latest update - click here to read it.